These contemporary Capless Baccarat Pens are 5.5" long. 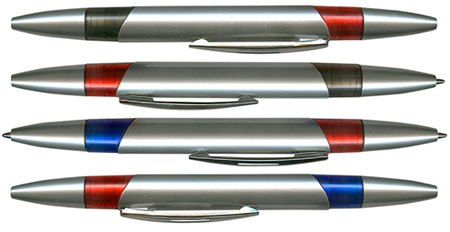 Our Capless Baccarat Pens are available with red/blue or red/black ink color combinations. Simply twist either end of the pen to produce the ball point. You can order Customized Capless Baccarat Pens with your casino's logo/message imprinted on each pen (1,000 Baccarat Pen minimum order). Regular production time for Custom Capless Baccarat Pens is 15 business days. Stock/blank pens are also available for fast shipment. Our double-ended Baccarat Pencils are 7.5" long. The Baccarat Pencils are available with red/blue lead and cap color combinations (all red and all blue pencils are available as well). We also offer Custom Baccarat Pens imprinted with your casino's logo/message (1,000 Baccarat Pen minimum order). Standard production time for imprinted Baccarat Pens is 15 business days. Our double-ended Baccarat Pencils are 7.5" long. The Baccarat Pencils are available with red/blue and red/black lead and cap color combinations (all red and all blue pencils are available as well). We also offer Custom Baccarat Pencils imprinted with your casino's logo/message (1,008 Baccarat Pencil minimum order). Standard production time for imprinted Baccarat Pencils is 15 business days. For additional information on our Baccarat Pens and Pencils, please contact us toll-free at 1-800-233-0828. You might also be interested in our complete selection of Baccarat Supplies, including Baccarat Tables, Baccarat Layouts, Baccarat Dealing Shoes, and Baccarat Discard Cans and Marker Racks.